The past two games had seen a total of 20 goals scored between the Penguins and their opponents. While the game against the Panthers was much lower scoring, it was a pair of goals in the last 5:04 of the 3rd period that allowed the Penguins to send the game to OT. Kris Letang and Sidney Crosby then connected on the power play for each player's 3rd point of the night to complete the Pens' comeback from a 2 goal deficit and pull out a 3-2 win against the Panthers. Sidney Crosby scored his 900th career point in the win and extend his point and goal scoring streaks to 10 games and 6 games, respectively. The first period was fast-paced and wide open, and the Penguins were lucky to escape with a scoreless tie as Florida registered 20 SOG during the period. After an early Carl Hagelin hook of Brian Campbell, the Pens PK showed a new wrinkle - Sidney Crosby sent out with the top unit, and the Pens responded with a more aggressive effort that saw several scoring chances go their way while down a man. The Pens had several chances to take the lead in the period but couldn't capitalize. Midway through the 1st, Crosby beat Luongo 5 hole on a shot that initially lit the red lamp before the official emphatically waved off that call; the shot had rung off the post and deflected away. Later in the period, a Pens' rush on the penalty kill saw Kevin Porter feed Kris Letang for a great chance, but Letang couldn't handle the pass and slide it into the empty net. It was a missed opportunity to steal a lead as the Panthers registered 64.7% of the shot attempts during the opening period in addition to receiving two power plays to the Penguins' zero. Florida finally broke open the scoring as Jussi Jokinen fired a shot near the goal line that a badly out of position Jeff Zatkoff allowed to deflect off his stick and into the net. Zatkoff lost control after reacting to a cross ice pass by Vincent Trochek to Jokinen, and Zatkoff was mostly in the net on the shot. 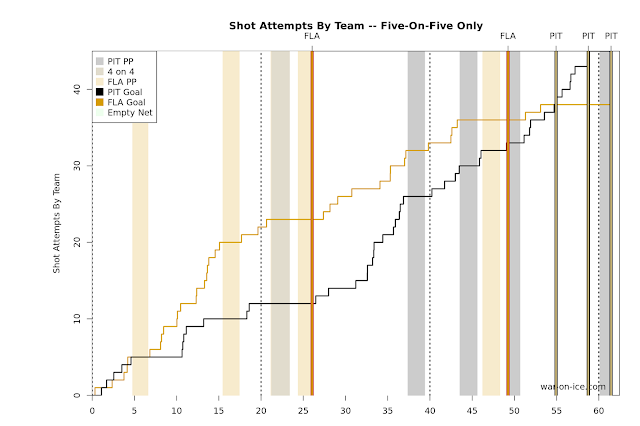 Pittsburgh started closing the possession gap after the Panthers goal, and they received a great chance to tie things up with 3 power play opportunities as well, but it ended up being a Pittsburgh power play that allowed Florida to extend the lead midway through the 3rd. After Pittsburgh threatened early on the PK, it was only fitting that the Panthers would return the favor. With Derek MacKenzie in the box for hooking, Jokinen sprung Alexander Barkov on a breakaway, and Barkov used his big frame to shield the puck from Trevor Daley and flipped a shot that squirted through off Zatkoff's pads to extend the Florida lead to 2. It could've been a back breaking goal to give up, but the Pens showed their resiliency and managed to cut the Florida lead back down to one with 5 minutes remaining in the 3rd. Crosby fed Letang for a one timer in the slot, and Chris Kunitz put the rebound home to give Crosby the milestone point. It was a big career moment, but it was Crosby's next two points that were the story of the game. With Zatkoff pulled, the Penguins had a crucial faceoff in the Florida zone. The puck came to Letang, who fired a shot that was headed wide of the net, but Crosby managed to position his body to deflect the puck into the net. Not surprisingly, it was Crosby and Letang who factored into the OT winner. Crosby sprung Letang on a breakaway off the opening faceoff, forcing Jokinen to hook Letang. On the ensuing power play, Letang one timed a cross ice pass from Crosby from the slot to finish off the comeback. The Penguins were dominated in possession in the first half of the game, but they managed to turn the tables on the Panthers after Florida's opening goal and ended up finishing with a score-adjusted 52.8 CF%. The Penguins managed to complete the comeback against the team that was leading the league in GA/gm at 2.20 entering tonight's game. It was a crucial two point for the Penguins, who now sit in 3rd place in the Metro Division just 4 points back of the 2nd place Rangers with a game in hand. The Penguins will return home Monday as the host the Anaheim Ducks.